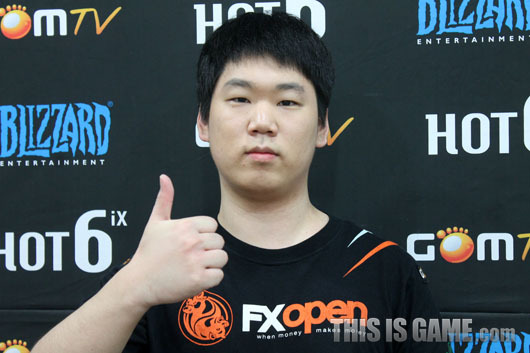 How does it feel to get into Code S for four seasons in a row? It makes me happy but I am not satisfied with my skill level yet. I have mixed feelings about sitting in the interview seat. I feel burdened by the fact that I should produce better games. I worried a lot because the patch has been a nightmare for me. My win rate was so bad after the patch that I even attempted to completely switch up my style. Luckily, I can say that the builds I prepared did their job which makes me happy. You used a surprise hellion build in Set 2. I mindgamed the Zerg. It’s actually a build that is easily scouted by an overlord scout but since the patch, Zergs haven’t been using the overlord actively so I opted for the build. It’s a use-once-only build since it’s so easy to hold once you know it. I probably would’ve lost if I used it in Set 1. 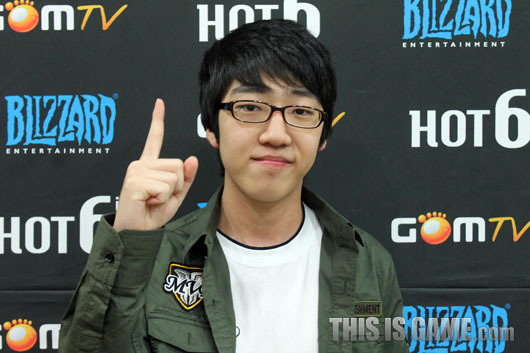 Despite being eliminated early last season, you are still high in the GSL ranks, do you want more points? I am happy about the fact that I have managed to stay in GSL for such a long time. Code A is okay but I want to stay in Code S. Rather than caring about points, I will aim for a championship. That should give me enough points to rise up in the ranks, shouldn’t it? Weren’t you worried about falling down to UnD? I’m stoked. If I fell today, I would have had to practise fully on for three days straight. I haven’t doing well since the patch so I wanted to overcome it this time. I think my hard work has paid off. Also, UnD at the moment is hell incarnate so anyone would want to avoid it. I want to make the finals for once. I think I was affected too much by the patch because my practice has been too inflexible. I will have to work hard to overcome this aspect. I want to thank our sponsors FXO and Razer. Also, I want to thank Terious, Sirius, Lucky, and Whale for practising with me. TheBest who sits next to me gave me a lot of helpful advice which let me play good games. Laslty, I hope FXO players do well in the qualifiers. Your thoughts on getting into Code S for the first time? This win makes me several times happier than any other game. I really wanted to get into Code S this season so I’m happy to have achieved that. I practised on ladder in my free time. That’s why I was able to hold onto that no.1 spot. I think playing on the ladder consistently helped improve my skill. I don’t think I got very nervous. Killer helped me a lot after he joined the training house. He advised me to stay confident and that was very helpful. Mech was used in Set 1. Facing a build I expected in Set 2 in Set 1 was very difficult to deal with. I worried about losing to mech again in Set 2. Terrans tend to all-in on dual sight. So, I focused more on making units which really helped. There’s a high chance you’ll get picked in ro32 next season. Group play means that it’s not all highest level players. I’ll just play a good match against players that I can match. Players who do well in Code A seem to lose steam in Code S. I want to get to ro8 to secure a placein Code S.
I want to thank my teammates who helped with practice and our sponsor Razer and partner MYM. I also want to say thanks to my family who always cheer me on. How do you feel about returning to Code S after one season? I had a bad dream this morning and had traffic problems getting to the studio. Then, I had to have the longest games too. Still, it’s all worth it since I won. I told some people I know that I would get into Code S before the season began so I guess I’ve kept that promise. Especially, I’m glad that I lived up to SlayerSJessica’s expectations and fulfilled my father’s wish. It was a very close full match. I have the worst headache at the moment. I sometimes have days where my head hurts and today is one of those days. It’s so bad that I’m having trouble enjoying my victory. I was hurting since before the match stared and now that the match is over, it’s worse. I tried using infestors against MKP before but lost in a close manner. At the time, I think I was just intimidated by his record. However, today I was able to play at a level I can be happy with. Set 3 was a back and forth game that you clinched just barely. There were many dangerous moments in that game. If it were a practice game, I would’ve had fun but as an official match, it was so hard on me. I don’t ever want to have another match like this. If I had lost, the shock on me would’ve been severe. It feels like I won by the skin of my teeth and if I had lost, I would’ve broken down mentally. I started practising more since joining the training house. However, rather than just the increased practice benefiting me, I think I was very lucky this season. Are you confident about doing well next season? I plan to take a bit of a break. I will first make sure I am in good condition and then enter the season. My mind is already set on the finals so I should start thinking more specifically how I should get there. I want the championship. I promised to treat the team to chicken today if I got in and now I’m worried about how much I have to spend (laugh). In the future, I don’t want to make promises I’m not certain I can keep. I was able to keep my promise this time since luck was on my side but from now on, I should think more carefully (laugh. It placed a lot of pressure on me. Lately, Jessica must have a lot on her mind so I hope my making Code S cheers her up a bit. Your thoughts on making Code S for the second season in a row? I played rather badly in ro16 so I had regrets about being eliminated. Fortunately, I’ve made it straight back into Code S while having trouble with practice because of my team’s situation so I’m extra happy. I am still practising with former teammates online. So, it’s not a lack of practice partners. It’ just practising alone at home which is giving me trouble. I am the kind of person who likes to have discussions with other players as I practice so having that taken away from me has been hurting my skill level. Are you looking for a new team? I think I should give it a lot of thought. That’s why I focused purely on practice even though I was approached by some teams. I do want to join a team before next season. I’ve been contacted by a few organisations but delayed the decision. Now that I am back in Code S, I should actively search for a team to join. Are you thinking about joining a foreign team? It’s true that the thought of joining a foreign team appeals to me since my family isn’t in the best financial situation. You do get a salary if you join a foreign team. You faced GhostKing, how did you prepare for him? GhostKing is one of the really good Terrans so I didn’t give myself that high of a chance. However, the players I practised with told me to go into the match with confidence. After Set 1, I improvised on the spot and thanks to that, I was able to get back into Code S.
I didn’t expect my opponent to opt for mech. EGPuma played a similar style against me in practice. I lost a lot in practice but it was a ton of help for today. You tend to become determined when your family is in trouble. I think I got arrogant after taking down DRG and jjakji last season. So, this season, I won’t pay the slightest attention to who my opponent is and prepare my best for every match. 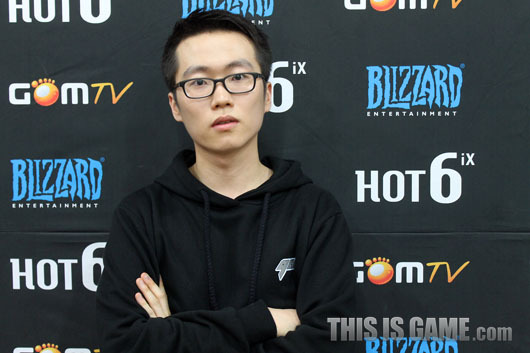 theWind wanted to continue on with oGs but due to personal circumstances, I wasn’t able to stay with him. He really cared for all of us so I am truly sorry. I’ve never lost with my girlfriend at the studio and she came to cheer me on today. I want to say thank you. Lastly, I want to find a great team and start playing in a stable environment. "I worried a lot because the patch has been a nightmare for me. My win rate was so bad after the patch that I even attempted to completely switch up my style. Luckily, I can say that the builds I prepared did their job which makes me happy." Yup. He probably took Sniper out to the clubs and got him a fistful of phone numbers. Sniper came back and was like BAM! SC2 ain't no thang!! 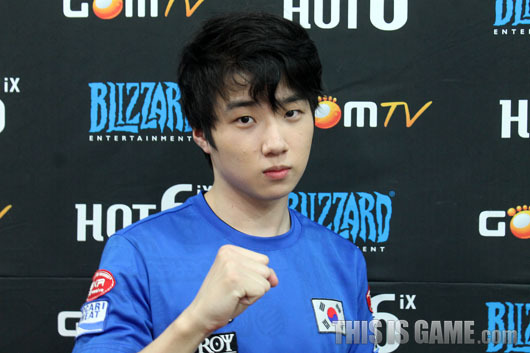 Yeah, it's gotta be SangHo considering the partnership between complexity and team MVP. CoL Killer moved into the MVP house a while back and I guess with all his experience he's giving some mental advice to the newer progamers. Yeah, making units is an useful skill toi have as a zerg. Too often forgotten. yep but not translated yet. Storywriter. I love you. Have my babies. Nice interviews, I was really impressed by Sniper today. Cheers Storywriter. He'll do it in his own time. sorry, good people of TL. I passed out while watching the games last night, haha. im really enjoying yugioh's interviews. he is always very honest.